As hundreds of thousands in Massachusetts enter their third day without power after this weekend’s historic winter storm; I spied something I’m sure they’re all eager to see. It reminds me of Hurricane Bob on the Cape back in 1991. Convoys like this kept pouring over the bridges from as far away as Virginia and Québec. Even so, we were still two weeks without power. 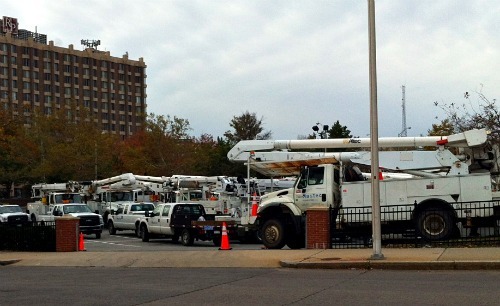 Utility workers apparently having a meeting about the work ahead. 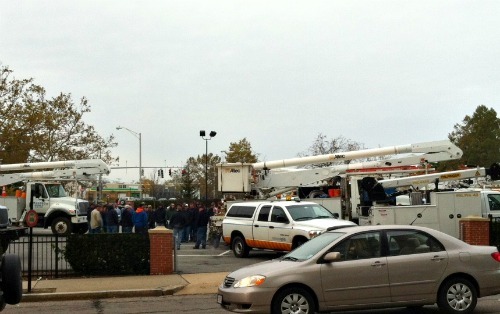 Hopefully crews can get our friends in Massachusetts and elsewhere hooked back up ASAP. I walked by this around 8AM today. And of course my @@#*(@#* Android phone decided to have a snit and the camera wouldn’t work. You’d think, the underpinning of Android is the Linux 2.6 Kernel. That’s a pretty stable kernel. It’s the Android layer that needs work.